After the above (first phrase), next, AzhwAr says, like how a farmer would plant and he himself would remove the weeds, emperumAn destroys the rAkshasAs who destroy the world He created. azhal vAi – and which have got the mouth that spits fire. Using the unparalleled bow that is curved on both ends, you shot arrows that have two teeth and with the mouth the spits fire, and destroyed lankA, where even the sun and moon were afraid to go above of it. Unlike your creation of brahmA which you did with just your sankalpam (ayanai InRanai), you physically stood in front of the enemy in the battle ground and destroyed him using your bow and arrows. It was not pirAtti (sIthA) who destroyed the demon who separated Her from You, it is you who fought and destroyed such demon. Likewise, I cannot remove the ones that separate me from You, that are, this samsAram and my avidhyA, karma, vAchanA, ruchi (lack of knowledge about nature of self, etc., long lasting impressions of my pApams, and the taste for other things, which I still have got left in me); only You please remove such demons that separate me from You. ‘bhIshO dhEthi sUrya:’ (sun rises because of his fear (obedience) of paramAthmA). But when rAvaNan was there in lankA the sun was afraid of Him and did not show his strength in that place (nainam sUrya: prathapathi – srI rAmAyaNam). Same can be applied to the moon also, so AzhwAr describes rAvaNan in this way. ilangai – like a wasp’s nest all these rAkshasas were having a ball in this place (ammaNa kUththadikkum / அம்மணக்கூத்தடிக்கும்), the rAkshasas who were a terror to anyone who would even just think of them – isn’t this the kind of place that He destroyed? iru kAl vaLaiya oru silai onRiya ireyiRRu azhal vAi vALiyin attanai – using the unparalleled bow that is curved on the two ends, using the arrows that is fixed on such a bow, the arrows having two teeth and which spit fire, you destroyed the place. azhal vAi vALi – when placing it in the bow it would look like an arrow, and when it strikes the enemy it would be like a fire. 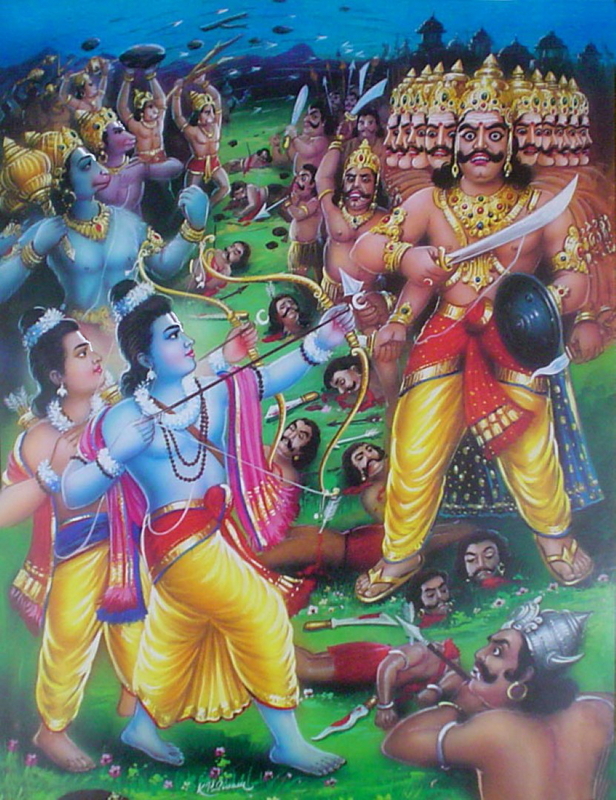 vALiyin attanai – as opposed to ‘ayanai InRanai’ above, where You created brahmA by your sankalpam, here you stood on the battlefield with your bow and arrows and tormented rAvAnan. oru muRai … attanai – you are the one who destroyed the demon who separated pirAtti from you, not she. Likewise it is you who has to destroy the samsAram and karma, etc., that separate me from you. in which he describes that for the AthmA it is not in-built with these karmAs and its effects; like how iron would get the heat and color when it gets in contact with fire, AthmA due to contact with achith (nonsentient, this body), makes us believe that this body is us, that is the avidhyA, and this is all due to karmam (accumulated good and bad effects), vAsana (trace of previously acquired bad karmas), ruchi (continued interest in such things). These are ‘aru vinai’ – very hard for us to destroy. nudangidaiyai – having waist that is tired and suffering due to separation from perumAL. mun oru nAL than vil angai vaiththAN charaN – by touching his bow; he is the means for us for destroying our hard-to-destroy connection with this samsAram, etc. muraN azhiya vil angai vaiththAn – ((angai = am kai : beautiful hand)) – to destroy the enemies he does not even have to set the arrow in the bow and shoot it – just his touching the bow with his beautiful hands would make the enemies lose their strength and get destroyed. nudangidaiyai mun ilangai vaiththAn – that is, our thinking that this AthmA is ours, whereas it is subservient to emperumAn, is equivalent to rAvaNan’s act of separating pirAtti from emperumAn. Also means that those who decided that emperumAn is the means for destroying their hurdles, emperumAn would take care of that, like how he took care of the enemy of pirAtti. Also to let us know that we hold relationship with emperumAn that is equal to pirAtti’s relationship with emperumAn. Also to imply to us that when we go with emperumAn as the means, we must get pirAtti as the mediator/connector (purushakAram), so the mudhal thiruvanthAdhi pAsuram uses the phrase starting nudangidaiyai that refers to pirAtti. Starting with oru pEr undhi in this prabandham (first phrase): you created everything from the stage of ‘non-existent’, so it is not difficult for you to help me who am in the stage of existing. Starting from oru muRai in this prabandham (second phrase which we are enjoying now): you destroyed rAvaNan who was the hurdle for Your being together with pirAtti, so it is not difficult for you to remove my hurdles for reaching you. This entry was posted in iyaRpA, thiruvezhukURRirukkai and tagged 4000, azhvar, azhwar, dhivya, divya, english, introduction, jeeyar, jIyar, kaliyan, kutrirukkai, meanings, naalayira, naalayiram, prabandham, thirumangai, thiruvezhikURRirukkai, thiruvezhu, vyakyanam on June 17, 2015 by raghuram.